Yesterday's technology news featured two events worthy of an annual commemoration: the Eastman-Kodak bankruptcy filing and Apple's announcement of its iBook initiative. Both show how corporations can prepare for changing times...or not. Kodak, inventor of the first digital camera, did not market it because the impact would be disastrous to their film-based model. It provides yet more evidence why Tim Wu's model of "disruptive technologies" often get suppressed in the name of profits. 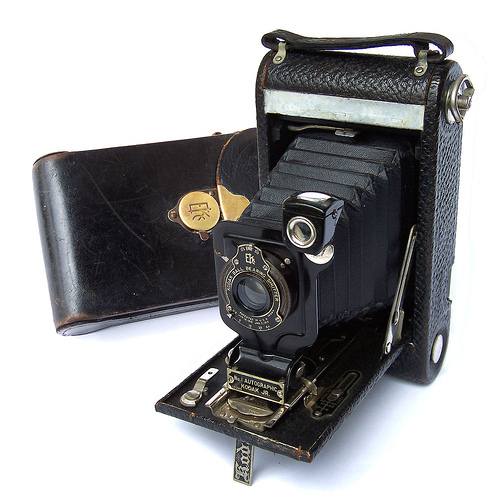 Fuji and other companies adapted to changing times and Kodak proved late to the game. Apple, the champion of technological comebacks, took a different route ever since Steve Jobs' return to the firm. Every iOS device released was lambasted, at first, by mainstream reporters. Jokes about the iPad in particular were sharp and pretty darned funny, to this observer. Unlike Kodak, however, Apple took a long view of how the devices might disrupt their sales of traditional computers, always far behind those running Microsoft's OS. Yet with less to lose, perhaps, Apple could gamble big on the future of digital content. I got angry at Apple, not long ago, over the iPad. It seemed to be Jobs' "up yours" moment to Mac loyalists. Now, the post-Jobs Apple plays the two computers as one system: create content on the Mac, show it on the iPad. Apple still won't put Flash on the iPad, but so far I'm happy with their device. And with the textbook announcement, they realized something I had said for years: the printed textbook is obsolete. Publishers rush to release new and expensive editions that students must lug about and then resell at a loss. These paper texts lack multimedia. My analogy for this is a botany text I own and love: the printed and $100 version can have color plates from a cloud-forest in Costa Rica or the Great Barrier Reef. The online version would have live video-streams from Webcams and embedded video demos. It would cost $20 and not be able to be resold. Kodak wanted to sell you a roll of film. 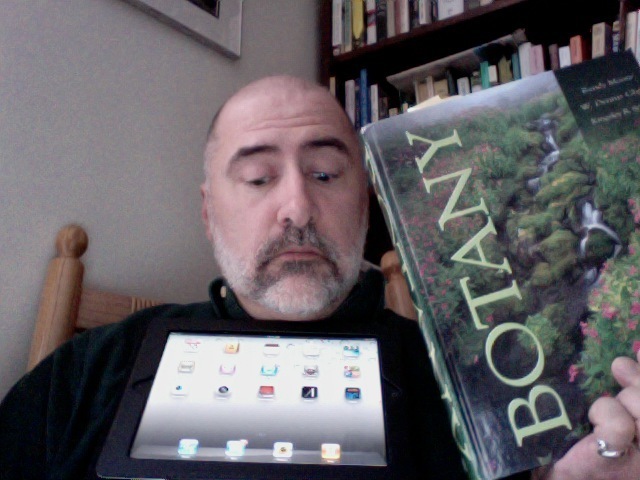 Apple wants to sell school systems an ecosystem: cheap iPad with publisher-vetted content that cannot be resold. Brilliant. Why did publishers wait so long? Apple took the systemic and long view, while Eastman Kodak sat on innovation. And thus empires rise and fall. Personal PS: we disconnected our land-line phone yesterday, for good. Of all days! I do have a dumb phone, while my more social wife got the iPhone. Call, and I may get back to you. Eventually. I agree; Apple always WAS about the ecosystem; that is why they focused on schools early on, being snobbish to anyone who wasn't buying 1000 Macintoshes at a time and let Miscrosoft run away with the home PC market. It almost cost them their business, but they learned from it. Congrats on losing your land line! I haven't had one for four years. After a storm the phone line was down for 10 days. At that point I used the line only for internet access, so I switched to wireless. During the recent hurricane I lost wireless access for almost two days and I could use free wifi at any Starbucks that had power. So glad I have a smart phone! It's like a mini back up computer. iBooks Author is a great idea! I tried to download it but I need to upgrade my OS first. Hope to read (and make) one of those multimedia books soon. Yep, Miso, MS had the bright idea of licensing their OS to all and sundry. Apple has learned, but it's still Steve's closed system. One wonders if MS came too late to this market to dominate it? That's why I'm pulling for Google...when I get a "smart" phone, I want it to run Android (though the iPad smokes the 'droid tablets I used).